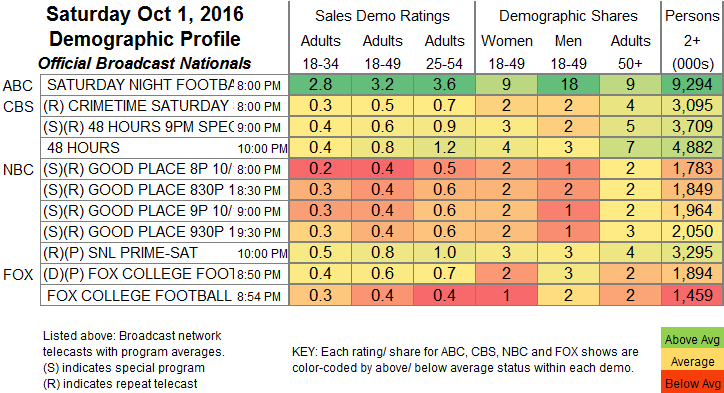 NETWORK FINALS: ABC’s COLLEGE FOOTBALL game adjusted up 0.1 to 3.2 in final numbers, while FOX’s game adjusted down 0.1 to 0.4. The 9:30PM rerun of THE GOOD PLACE was also down 0.1. CABLE HIGHLIGHTS: It was all COLLEGE FOOTBALL and animation in Saturday’s Top 10. (HBO insists on labeling its theatrical movies as “originals,” which is why DEADPOOL is on the chart, although that 0.74 is still a notably good number.) ESPN had a trio of games (and 2 more in the Top 15, counting one on ESPN2), topped by the primetime Kentucky vs. Alabama match-up at 0.95. 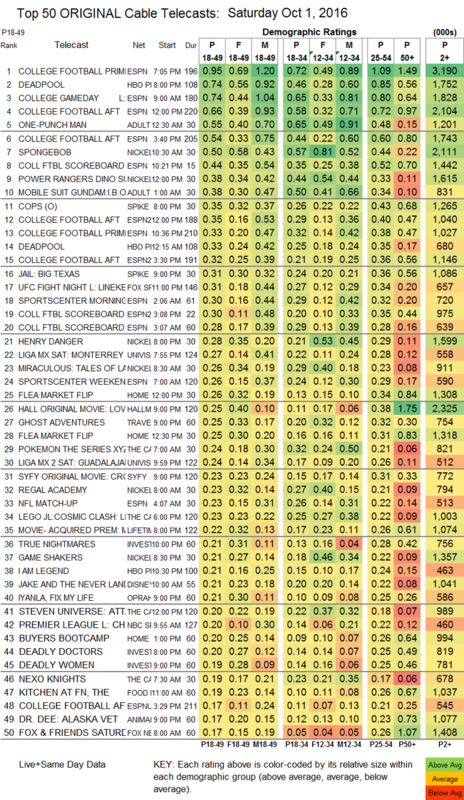 Adult Swim’s late-night animation line-up had DRAGON BALL Z down a tick to 0.58/1.255M, ONE-PUNCH MAN down 0.07 to 0.55, MOBILE SUIT GUNDAM down 0.11 to 0.38, HUNTER X HUNTER down 0.06 to 0.38/816K, NARUTO down 0.04 to 0.37/783K, ONE PIECE down 0.04 to 0.31/677K, and then a trio of PARASYTE episodes at 0.27/584K, 0.25/536K, and 0.25/518K, compared to last week’s 0.31. In animation aimed at a younger crowd, a pair of early Nickelodeon shows were in the Top 10: SPONGEBOB at 0.50, and POWER RANGERS up 0.02 to 0.38. On Spike, COPS ticked up to 0.35, and JAIL: BIG TEXAS was up 0.07 to 0.31. Fox Sports 1’s UFC FIGHT NIGHT was at 0.35. Hallmark’s original movie LOVE ON A LIMB was at 0.25, Syfy’s THE CROOKED MAN was at 0.23, and Lifetime’s MY HUSBAND IS MISSING was at 0.22. On Food Network, KITCHEN AT FN dropped 0.07 to 0.19, and VALERIE’S HOME COOKING was at 0.13.